Multi award-winning South African-New Zealander URZILA CARLSON has become a household name in Australia in the past year, and she returns from across the ditch this year with a national stand up tour. 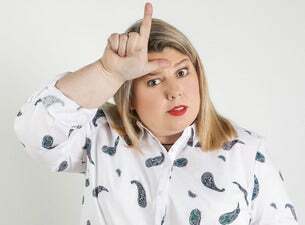 Carlson will take her brand-new comedy show, LOSER, to 10 cities and regional centres around the country from March to June in 2019. Commencing at the 2019 Melbourne International Comedy Festival on March 28, the MICF season of Loser will see Urzila become the first female comedian to perform a full run at Melbourne Town Hall’s Main Hall. Following Melbourne, Loser will head to Brisbane, Townsville, Canberra, Launceston, Hobart, Adelaide, Perth, Newcastle and Sydney. Due to continuing demand, extra shows have been added in Brisbane, Sydney & Perth. Tickets for the 3rd Brisbane, 3rd Sydney, and 2nd Perth shows go on sale at 10am on Tuesday, February 5. For complete tour and ticketing details, visit: livenation.com.au. 2019 is already shaping up to be Carlson’s biggest year yet with her NETFLIX debut on January 1. Urzila was one of 47 comedians handpicked from around the world to film her half-hour special in Montreal at Just For Laughs in August as part of Netflix’s unprecedented stand-up comedy event series. She was also one of the key cast of fellow comedian Nazeem Hussain’s flagship show Orange Is The New Brown which aired late last year on the Seven Network. Urzila is a series regular on Network Ten’s smash-hit panel show, Have You Been Paying Attention?!. The 2017 winner of the Sydney Comedy Festival’s Director’s Choice Award was born in South Africa, and now calls New Zealand home where she is a household name and a cast member of popular NZ comedy panel show 7 Days. Selling out is a regular occurrence for Carlson in both Australia and New Zealand. In 2018, she sold out her entire MICF season including extra shows in record time becoming one of the biggest sellers of the Festival. Since first taking to the stage in 2008 Urzila has racked up an impressive array of awards including Best Female Comedian at the NZ Comedy Guild Awards no less than six times, as well as NZ’s coveted People’s Choice Award two years in a row at the NZ International Comedy Festival. In October Urzila became the new Australasian Ambassador of South African Tourism for both Australia and NZ.